Charles Soule said the second volume of Marvel’s Star Wars: Darth Vader will end with issue #25, concluding what has been a character-defining arc for the character. The news, revealed at the Lucasfilm publishing panel at New York Comic Con on Oct. 5, was softened by the reveal that Aftermath trilogy author Chuck Wendig is writing a five-issue mini series — Shadow of Vader — that will focus on people affected by the Sith Lord as it travels from the prequels to the sequels, with themes from his trilogy, including the Acolytes of the Beyond. It is set to start in January. The panel was an informative one, given the attendance of Jody Houser and Greg Pak, each of whom is writing arcs for Marvel’s 30-issue maxi series, Age of Star Wars. Houser, who is writing the Age of Republic, said she’s written some issues, including December’s Darth Maul and Qui-Gon Jinn stories, and is working on the General Grevious story. Pak, who is writing the Age of Rebellion, said one of his issues focuses on how Leia Organa saved Han Solo during the Return of the Jedi. 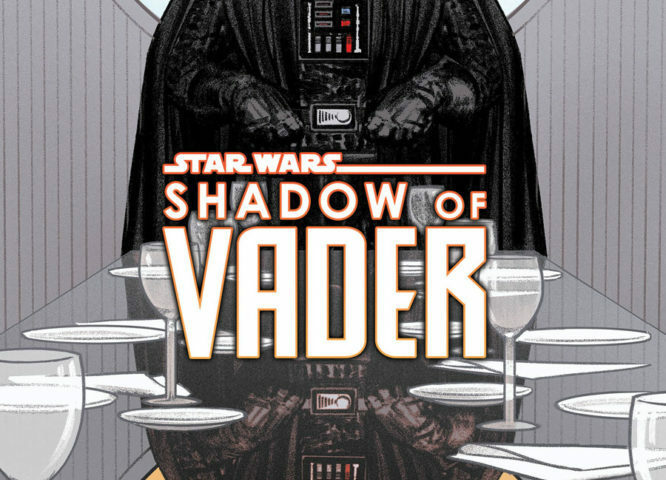 Other characters getting their own one-shot issues include Boba Fett, Lando Calrissian, Grand Moff Tarkin, Luke Skywalker, Darth Vader, Jabba the Hutt. Meanwhile, Robbie Thompson, who is writing the now seven-issue Solo: A Star Wars Story adaptation as well as Han Solo — Imperial Cadet, liked the latter series as Full Metal Jacket meets Stripes, a clear sign that it’s going to be serious and comedic, but profound. Tom Taylor, who is writing Age of Resistance, was not in attendance, but tweeted that he’s writing one-shot issues about the characters featured in the teaser art, including: Finn, Poe Dameron, Rose Tico, Rey, Captain Phasma, General Hux, Supreme Leader Snoke and Kylo Ren.